Maqui is a small dioecious tree native to South America, in particular in Chile. It can reach 4-5m in height and is evergreen. Its Latin name is Aristotelia chilensis. In the culture of Mapuche, Chilean native inhabitants, this plant is sacred and symbolizes "good will". Its berries and leaves have been widely used in folk medicine in Chile for centuries. Locals also believe it can enhance their longevity. Recently scientific research has demonstrated that maqui berries have very high content of antioxidants. Scientists also revealed that free radicals are the main causes of many chronic conditions and diseases, whereas Antioxidants can enable our bodies to get rid of damaging free radicals that can actually cause premature aging and disease. 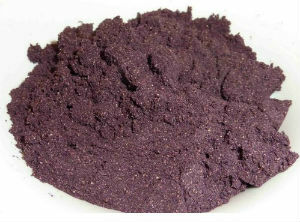 In this sense maqui berry has detoxification and anti-aging properties. Our raw maqui powder is made by freeze drying technologies. With this method, maqui fruit is not exposed to high temperatures, thus maintaining its physical, chemical, biological and organoleptic properties.